On Saturday, August 25, 2012, I took the accompanying photo of my family exploring the raw land on which the Mecklenburg County Bar & Foundation Center is now located. The 2012-13 fiscal year was my first year on the Mecklenburg County Bar (MCB) Board of Directors and we would soon vote on whether to make an offer on the land. My husband and I loaded our three Labrador retrievers into the Lab Cab (our SUV) and headed out to the land under consideration. The five of us walked the entire Greenway Business Park and got a good feeling about the location and the possibilities it offered. Howdy, our black lab, was so excited he could not sit still, causing him to look like a hologram in the photo. Tucker, our yellow lab, is the honor student of the group and was probably performing a site survey in his head. 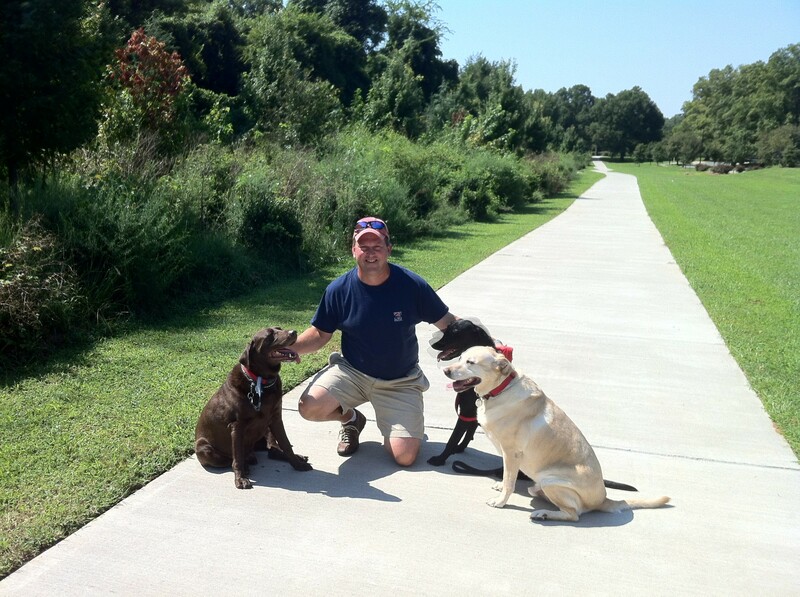 The chocolate lab in the photo, Bailey, has since gone to dog heaven and is succeeded by our newest chocolate lab, Happy. We’ve now occupied the Bar & Foundation Center for more than three years. After some bumps in the journey, the Mecklenburg Bar Foundation, MCB and Myers & Chapman have amicably resolved their differences regarding the design and construction of the Mecklenburg County Bar & Foundation Center and have settled all matters to their mutual satisfaction. With approximately 24,000 square feet, 150 parking spaces, modern technology and rooms equipped to host meetings, conferences and events, the physical space that we envisioned as a resource for members and the community is now a reality. Our members use the Bar & Foundation Center every day for purposes related to their law practice, and members who use it tend to do so with increasing frequency. That’s a good sign! Members are encouraged to reserve the Bar & Foundation Center for client conferences, depositions, arbitrations, trial preparation, retreats, mediations and other uses related to the practice of law. You can make reservations under the facility use policy developed by member volunteers and approved by the MCB Board of Directors in March 2017. Find the policy here: https://www.meckbar.org/index.cfm?pg=facilityusepolicy. We strive to be a good community member by sharing our space with affinity bars and community organizations that promote and enhance the MCB’s mission and goals. The Arts & Science Council, Biddleville-Smallwood Community Organization, Charlotte-Mecklenburg Police Department, City of Charlotte, Community Building Initiative, Hispanic National Bar Association, NC Academy of Defense Attorneys, NC Advocates for Justice, NC Bar Association, NC State Bar, Wake County Bar Association, and Women Lawyers of Charlotte are among the vibrant, diverse groups that have used the Bar & Foundation Center. If I don’t see you at the MCB Holiday Party on Thursday, December 7, let me take this opportunity to wish you the very best of the holiday season. I hope that you get to spend time at your version of home with the people (and pets!) that matter most to you.